In this segment, we’ll look into apparent acts of federal agents incompetence, willful blindness and observable acts of clear duplicity. 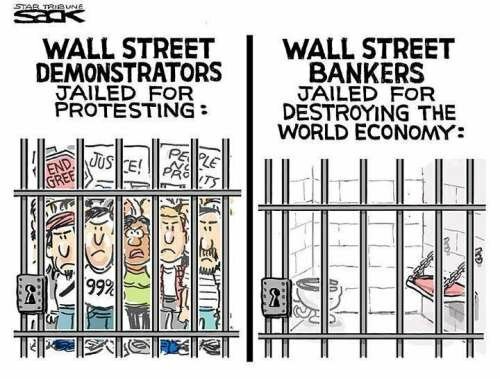 Today we will be looking at what are known as Deferred Prosecution Agreements (“Defers”) aren’t even slaps on the wrists; because those fines are paid by the stockholders and not Wall Street executives who should be convicted. An even more alarming fact is that the more this reporter digs and talks to the Etoys federal case whistleblower Laser Haas. The more cases that show numerous occasions where federal agents are turning up directly connected to this revolving door, which some even have payoffs involved to exiting prosectors under the guise of Deferred Prosecution Agreements. A good majority of the population, not so long ago, had another phrase coined for federal agents getting millions of dollars, to forego – prosecutions! But it seems today that the rule of law has been forgotten. Back in 2001, with Smoking Guns unearthed in 2004, several Wall Street crimes were brought to the attention of federal agents and agencies alike, such as the SEC, DOJ, FBI and United States Trustee program, in Delaware, by the eToys federal case whistleblower. Unbeknownst to the eToys whistleblower at the time, the Delaware United States Attorney, Colm Connolly, had been a partner of the very MNAT law firm that Laser Haas sought to be indicted for a plethora of alleged crimes. This single case of Colm Connolly & MNAT is corroborative proof that the “revolving door” paradigm needs to be addressed by Congress but this isn’t the only instance of revolving doors you will hear about in this series. As noted by his resume (archived), Connolly was a clerk for a 3rd Circuit Justice who was, coincidentally, a partner of MNAT. Connolly became an Assistant United States Attorney, Delaware, in 1992, after clerking for an MNAT partner; and Connolly remained a federal prosecutor until 1999. As this reporter noted, in previous articles, Colm’s next step into the “revolving doors” was his partnership, from 1999, thru August 2, 2001, with MNAT; which is mired in controversy, concerning billions of dollars in losses to Mattel and eToys investors & creditors as previously reported. Visibly, for those closely following the series this is an important era of time (retroactively speaking), as it is the exact period when the eToys, Kay Bee, Stage Stores, Fingerhut and ‘ The Learning Company’/Mattel fraud cases were ensuing. All during this same time, MNAT was assisting Goldman Sachs, Bain Capital, and Paul Traub’s schemes, whilst Paul Traub was “controlling” the infamous Tom Petters Ponzi scam. (see the first 4 pages of this Petters Ponzi Complaint against Traub – here). The problem appears everyone at the time, but the whistleblower knew the “fix” was “in” with Colm Connolly. As noted, previously, by this reporter, Rolling Stone ‘s “Greed and Debt” article (which, by the way, failed to give credit where it was due according to the whistleblower) pointed out an interesting fact, that sometime prior to 2004 – after Bain Capital appeared to have fleeced eToys federal estate assets, deceitfully – the Kay Bee CEO, Michael Glazer, paid himself $18 million and Bain Capital $83 million. Coincidentally, the MNAT law firm represented Bain Capital of the $83 million and Paul Traub’s firm asked to be the one to prosecute Glazer and Bain (Traub’s Traub Bonacquist & Fox (TBF) law firm concealed the fact he worked under Romney, Bain & Glazer at Stage Stores). One of the complaints of the eToys whistleblower, which has never been addressed, to this very day, is that the whistleblower was offered a million dollar bribe to join Romney’s roaming manager gangs because Mitt wanted eToys as cheap as possible – but the whistleblower was top eToys executive running the bids up by tens of millions. This appears to be why Kay Bee’s top exec, Michael Glazer, got $18 million, illegally, to make sure Bain Capital got away with $83 million more. Apparently, just after the eToys case whistleblower turned down and reported the bribe attempt, this is when Connolly returned to the Delaware Department of Justice. This time – the continuous “revolving door” of Connolly – is his becoming the top dog, as the United States Attorney, on August 2nd, 2001. Another glaring coincidence, with Colm Conolly’s 1999 to August 2001 partnership with MNAT, is the fact Mitt Romney’s 2012 POTUS Campaign claimed he was “retroactively” retired from Bain Capital, as of August 2001, back to February 11, 1999. Would we allow Al Capone to ‘retroactively’ retire from his organized crimes? Did N.J. U.S. Attorney Chris Christie Scheme by Deferred Prosecution Agreements? It wasn’t until 2007, that the eToys whistleblower learned that he had given the smoking gun proof of MNAT & Traub’s racketeering to a federal prosecutor (Colm Connolly) who was an undisclosed partner – of MNAT. Upon realization, by the whistleblower, he was providing proof of racketeering to a ‘revolving door’ conflicted federal prosecutor. The whistleblower traveled across the country, to Los Angeles United States Attorney, Debra Yang, who was in charge of then-President George W. Bush’s Corporate Fraud Task Force. Los Angeles is where Laser Haas ran eToys.com federal estate, from eToys corporate headquarters, on Olympic Avenue. Congress was already made abundantly aware of the mass corporate frauds of WorldCom and Enron. Also, the lawmakers were keenly conscious that bankruptcy, insider attorney’s (like Paul Traub and MNAT) would carve up estates, for themselves, at the direct detriment of their clients. This backstabbing, of court-approved clients, for the sake of more lucrative, secret ones (in this case Romney, Bain Capital, Wells Fargo and Goldman Sachs), is not only many violations of RICO; it also violates the number one fiduciary duty of attorney’s at law – oath to the BAR – of a client’s interest being first & foremost. Colm Connolly and others in the Justice Department, along with MNAT law firm, and Paul Traub, constantly get away, with habitual backstabbing, of clients they swear, under oath, to protect. These organized criminal efforts defined as RICO crimes are named by Congress, to be a “Bankruptcy Ring” (see Third Circuit case in Arkansas – here). Even United States Attorney General, John Ashcroft, appears to have found an early Christmas gift, he and Debra Yang, couldn’t resist. Both United States Attorney, Debra Yang and exited USAG John Ashcroft, are gifted a $50 million dollar – NO BID – Deferred Prosecution Agreement, in 2007 by NJ U.S. Attorney, Chris Christie, making him an instant millionaire, gift provider. As reported, there were many questions about Chris Christie giving out the forgoes of federal prosecutions. The whistleblower notes them being “get out of jail free cards”, with monies specious. “John Ashcroft. Christie’s former U.S. Justice Department boss made $28 million to $52 million or more in 18 months for monitoring Zimmer Holdings, one of five medical device manufacturers accused of giving kickbacks to surgeons for using their replacement hips and knees. — David Kelley. A former U.S. attorney in Manhattan, Kelley investigated a stock fraud case involving Christie’s younger brother, Todd, but declined to prosecute him. Kelley was later picked to monitor Biomet Orthopedics Inc., another of the medical device makers. To pour gasoline on the obvious fires, beyond the Deferred agreements and Congressional notes of “Bankruptcy Rings” of conflicted counsels, is the 2007 public hearing reports, alarming, quote by former USAG John Ashcroft, concerning “corrupt federal judges in collusion with high ranking members of the United States Trustee program” (where the U.S. Trustees are the police of the bankruptcy courts). “Bankruptcy court corruption is not just a matter of bankruptcy trustees in collusion with corrupt bankruptcy judges. The corruption is supported, and justice hindered by high ranking officials in the United States Trustee Program. The corruption has advanced to punishing any and all who mention the criminal acts of trustees and organized crime operating through the United States Bankruptcy Courts. As though greed is not enough, the trustees, in collusion with others, intentionally go forth to destroy lives. Exemptions provided by law are denied, debtors. Cases are intentionally and unreasonably kept open for years. Parties in cases are sanctioned to discourage them from pursuing justice. Contempt of court powers are misused to coerce litigants into agreeing with extortion demands. This does not ensure integrity and restores public confidence –“. It is an alarming statement for the nation’s number one, top dog, law enforcer to say the “American public is victimized and held hostage by bankruptcy court corruption. ”In the “revolving door” era of quid pro quo, the Public is entitled to know – if – US Attorney, Chris Christie’s $50 million dollar gift to his former, top federal prosecutor boss, was the type of “bizness” that launched Christie’s political career, where he became Governor? Many federal agents and reporters accused the eToys whistleblower of fabricating the remarks; because, since 2007, the statements made by Ashcroft were redacted, entirely, from the web. Armed with this glaring USAG condemnation of bankruptcy system corruption, and the newly discovered Smoking Gun of Colm Connolly’s resume, aided by a former bankruptcy task force party’s clerk, the eToys case whistleblower files an 18 U.S.C. § 3057(a) Complaint with the Los Angeles United States Attorney’s office, where the Public Corruption Task Force is housed. Making the degree of reprehensibility go far beyond the shocking of one’s conscience, not only did they dismantle the Task Force, the DoJ stipulated the Public Corruption Task Force was dismantled because there were no public corruption cases to prosecute. The powers that be also threatened career federal prosecutors, to keep their mouths shut. As if all the above, isn’t enough to blow your mind, it gets far worse. In future articles of this series, we’ll detail the fact that many national fraud schemes are all connected; and how 100s of felonies go unpunished. These cases don’t get investigated, much less prosecuted! America has the right to know, how it is, that the “revolving door” dynamics are becoming systemic and incestuous, in the corrupting of our federal systems of justice. Obviously, the incompetence, willful blindness and “revolving door” acts, visibly duplicitous, would greatly embarrass the Department of Justice agents/agencies – and the federal courts. Unfortunately, these particular “revolving door” dynamics have directly contributed to the bigger scandals of Bernie Madoff, Petters Ponzi, Jack Abramoff partners threatening eToys shareholders, with assassination and 100 other racketeering “predicate acts” benefiting Goldman Sachs partnership with Bain Capital, going on flagrantly and blatantly; because the “revolving doors” guarantee great retirement benefits, like Deferred Prosecution Agreements, in the many millions of dollars. Capone is turning over in his grave at how easy, corruption is Today! If you want to support my work and make a difference to journalism/investigation, you can subscribe to my Patreon and become a THOUGHT CRIMINAL or make a one time payment in Cryptocurrency below I even accept pre-paid gift cards! Way more than 30 million but the principle stands. 3 of 5 bellyrub compensation votes delivered! Another fine post. Thank you and I am glad you are enjoying the series the best is yet to come. Although, we can connect 100s of bankruptcy rings which is what we plan to do next year! Upvoted your comment so you can get back some of that SBD you have been giving people out of your own pocket thanks again for that Neoxian. Congratulations @an0nkn0wledge, this post is the seventh most rewarded post (based on pending payouts) in the last 12 hours written by a Superuser account holder (accounts that hold between 1 and 10 Mega Vests). The total number of posts by Superuser account holders during this period was 1027 and the total pending payments to posts in this category was $5930.45. To see the full list of highest paid posts across all accounts categories, click here. While profits seldom seem to significantly trickle down, we can easily see that corrupt influence does, all too well. I see local cops in these exact same kinds of games, nowadays. The @OriginalWorks bot has determined this post by @an0nkn0wledge to be original material and upvoted(1.5%) it!